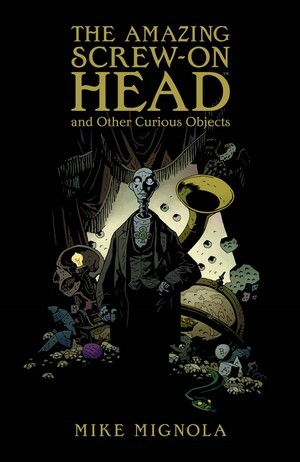 The Amazing Screw-On Head & Other Curious Oddites by Mike Mignola, with colours by Dave Stewart. Published by Dark Horse Comics. He has a head. It screws on to things. The Amazing Screw-On Head is a stand-alone comic that Mike Mignola produced 8 years ago. They even made an animated film of it a while back. While originally conceived as a throw-away one-shot, it’s widely considered one of the very best single comics that Mignola has ever produced, and as such, I can see why Dark Horse felt the need to reprint it. However, it’s only 22 pages long. So they’ve added another 2 rare previously released Mignola stories, another 2 stories that he did just for this collection, and some sketches. And voila, you have a cash grab! I’m being harsh, but even with the new material from an incredible artist who rarely picks up the drawing pencil these days, the main reason to pick this up is still Screw-On Head, and if you already have it, then I can’t say that this collection is a must-buy. But it sure is a lot of fun. The original story remains as brilliant, as wacky, and as strange as it did in 2002. For those of you who haven’t read it, here’s the sum up: Emperor Zombie has broken into the Museum of Dangerous Books and Papers and wants to use an ancient manuscript he’s stolen from there to take over the world. Abraham Lincoln dispatches a talking robot head to stop him. The end. It’s absurdist to the extreme, and with lines like: “All really intelligent people should be cremated for reasons of public safety” and “Free at last from my vegetable prison”, you’d think it would be hard to take seriously. But it really isn’t, because of the medium that it’s being told in. This is the type of story that you could only find in a comic book, and it’s a must read by any real lover of the medium. It puts a smile on my face every time I read it, and it’s great to finally have it on my bookshelf, as opposed to stuck in a plastic bag. The other stories included in the collection are nice to have from a completist stand-point, but I cant say that any of them stood out to me,,though the Eisner Award-Winning “The Wizard & The Snake” does have it’s charms. This is a must-own for any serious Mike Mignola fan, though maybe not if you already have the original comic book. Rating: B for the collection, A+ for the original story. 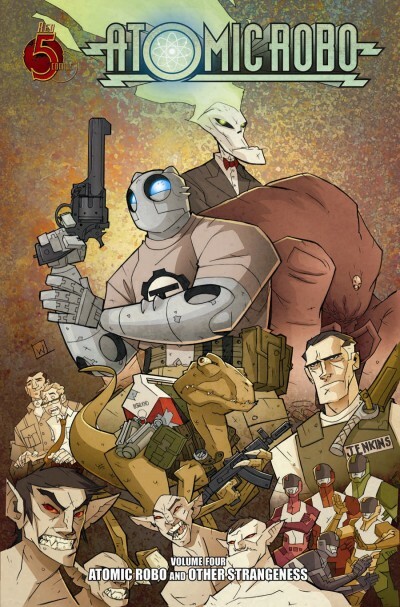 Atomic Robo Volume Four: Atomic Robo And Other Strangeness by Bryan Clevinger and Scott Wegener, Published by Red 5. If Indiana Jones and Venkman from Ghostbusters had a baby, and then that baby screwed a toaster, that toaster’s baby would be Atomic Robo. Blowing you away with science! It’s fitting that I’m reviewing the latest Atomic Robo trade alongside a comic by Mike Mignola, since the easiest (and laziest) way to describe Atomic Robo is by comparing it to Mignola’s Hellboy. While in some ways this is of course a compliment, due to Hellboy/B.P.R.D. still being one of the most consistently entertaining series of adventure comics around, in other ways it sells Robo short, and doesn’t really give you a sense of just how good this comic has become. Very few comic books put a smile on my face the way Atomic Robo does, and while this latest mini-series might not have the science-y twists and turns that I loved in The Shadow From Beyond Time, it’s still a worthy addition to the Robo mythos. It’s essentially a snapshot of an average week in the life of Atomic Robo, an 80 year old science adventurer originally created by Nikola Tesla. During this week we see him repel an invasion from the Vampire Dimension, team up with Japan’s Science Team Five to combat giant monsters, and face the dreaded DR. DINOSAUR!!!! If you like your comics fun, pulpy, and full of mind-blowing science, this is essential. New series starts in November, hopefully this will hold me over until then. Wednesday Comic Woundup: 1930’s Southern Race Relations, and new BONE!